This activity needs a good supply of recycled paper and scissors for each person. Can you make the free standing model above using only scissors and paper? It will require some thought and planning. It may also take some 'trial and improvement' so ensure you are using recycled paper. Using a similar method as was used for the toast rack above, can you construct an Olympic winners' podium? Believe it or not it is possible to fold a pentagon from a piece of A4 size paper. You will need Flash enabled to see our movie! Use the net provided here to construct a dodecahedron with this year's calendar printed on for your desk. A desk Cube Calendar can be made using two cubes to show the day of the month. 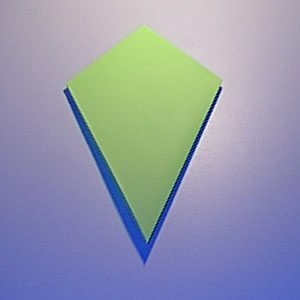 With just three folds it is possible to transforman A4 sheet of paper into a beautiful kite. You can find the step by step instructions on our Kite Maths page. 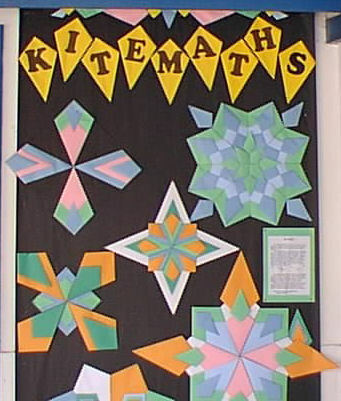 We have a whole section on the mathematics of kites and how they make great classroom displays. After practising with recycled paper the kite activity can be enhanced by using coloured A3, A4, A5 and A6 sized paper. The Christmas tree below was made from one green sheet of A4 paper and then mounted on a red sheet of paper. Can you work out what cutting was required? Create your own dynamic geometrical diagrams using this truly amazing tool from GeoGebra. So far this activity has been accessed 14 times and it is ready for you to enjoy!